Toasted bread rounds, crackers, or pita chips. Preheat oven to 350˚. Spray a 11⁄2-quart baking dish with nonstick cooking spray. Set aside 3/4 cup crumbled bacon. In a large bowl, combine remaining bacon, cream cheese, shredded cheeses, sour cream, mayonnaise, Italian seasoning, garlic powder, salt, pepper, and mustard. Spoon mixture into prepared baking dish. Bake for 25 to 30 minutes or until hot and bubbly. 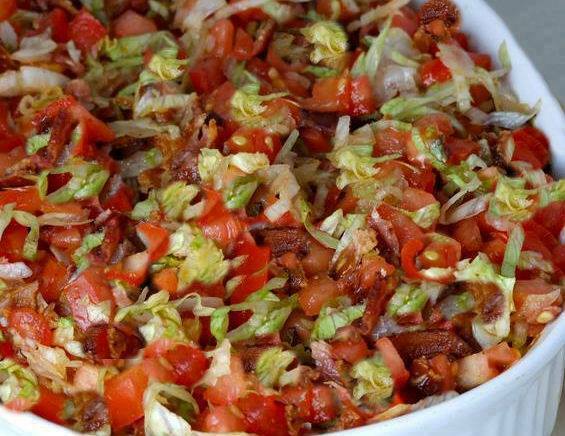 Sprinkle chopped tomatoes, remaining 3/4 cup crumbled bacon and lettuce over hot dip. Serve immediately with toasted bread rounds, crackers, or pita chips..